After just over 18 months of retail trading as Tooth & Claw, we decided on a (not so little) re-brand of our boutique. We decided that it was perhaps better to split the 2 arms of our business – keeping the name Tooth & Claw for our design brand, but renaming the shop. 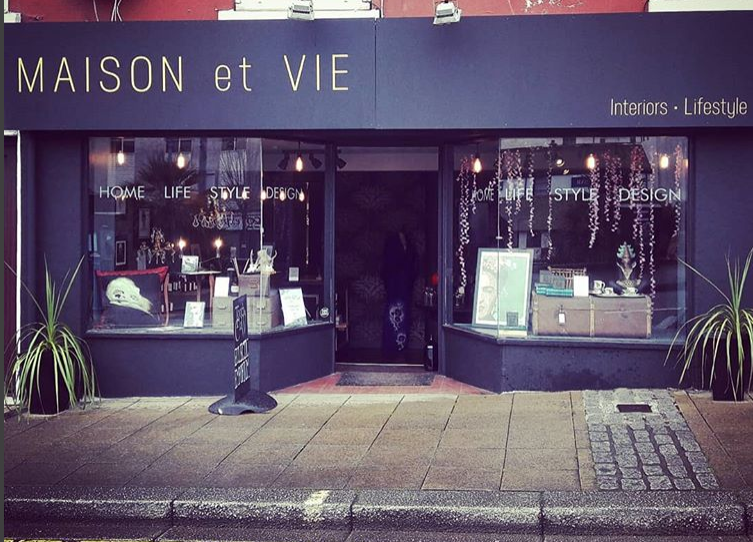 We decided on the name Maison et Vie because it is a kind-of “does what it says on the tin” name – House/home and Life – we sell beautiful things for your home and for your life. And it had to be french… everything sounds better in French. Jamie designed a new logo using the typeface we had chosen. And as we wanted to keep black as our base branding colour, we chose to use antique gold as the lettering colour – moving away slightly from the black and grey of Tooth & Claw – to give a bit more of a glamorous look. The new signage went up on the shop in April 2018. We are still in the throes of changing everything over… so eventually this website will change over to Maison et Vie. I am hopefully also upping the quota of “lifestyle product” and am working with some exciting jewellery and accessory brands to expand the product range we offer instore. More exciting stuff to come…….